REPLACEMENT is the ultimate entrepreneurial achievement. For most affiliates there exists a time gap between the need or desire for quick, cheap and easy media buying in your business and that milk ‘n honey afterlife, and that won’t take care of itself. Replacing yourself, outsourcers, and any employee is an opportunity to “step up” to a high level in your business for expansion or exit. Raising the value & equity in your business will make your business stand out as superior to your competitors. It will help you if you want to expand your business and scale up. It puts you in a position to build a company and replace yourself. Our challenge with this client “Company X ” was that migrating into LanderBolt quick, fast and cheap. They saw the enormous value, but needed a few things to make the transition seamless. Facts: They have many landing pages, 2 designers, their own server system, and could not see the 10,000 foot view of the overall big picture, not to mention unknown landing page load speeds. A problem that so many advertisers face who use pre-landers and bridge pages, and that’s is pretty much everyone. 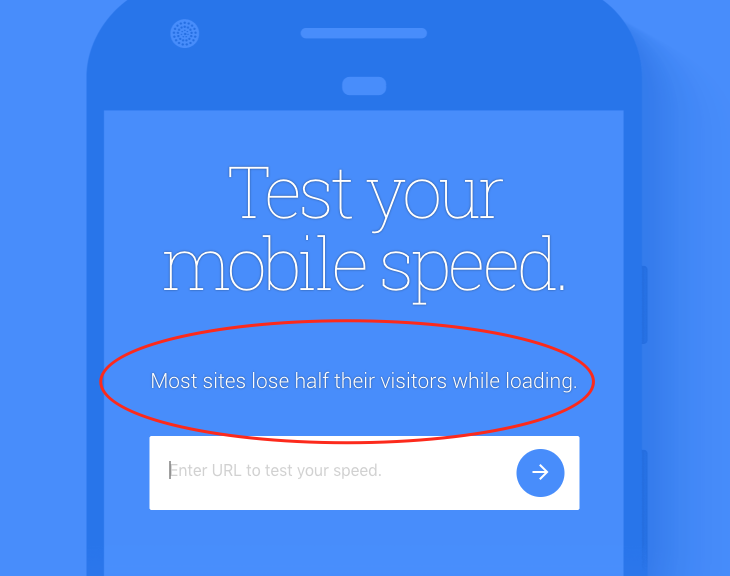 Especially when google predicts that 50% of all mobile traffic is lost due to slow load times. Can you see the value in trusting LanderBolt do what it does best and solve all those problems and much more. As co-founding chairman & CEO, I talk to many CEO’s and high level executives who oversee the media, ad spend, and performance results. They want automation to be quicker, and more productive. We simply asked what “Company X” wanted and we built from scratch three seriously badass features. Development is the bottleneck of any SaaS company. Everyone has great ideas, but turning them into a feature and then turning that into money is the most challenging aspect of development. At LanderBolt, we have a system we created so we can update our SaaS in 3 days instead of 3 months. I’m talking about major business changing features. 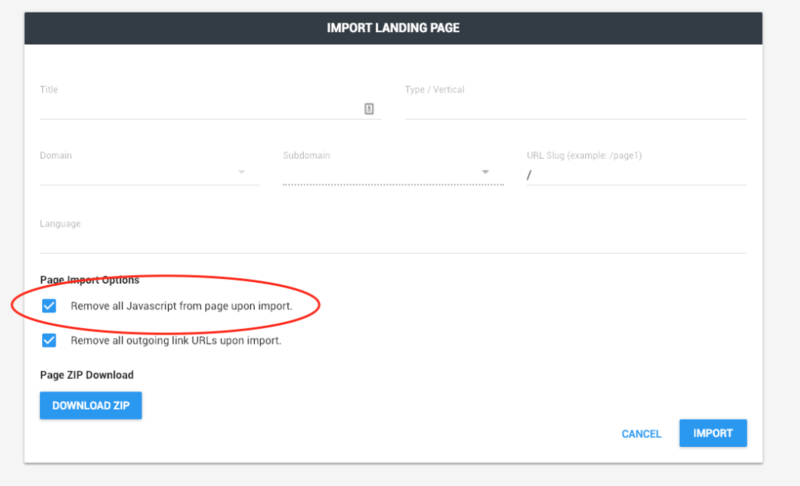 Number one, company X wanted to import their existing pages using our 7 click import feature. They ran into a road block because LanderBolt cleans the page of any tracking codes and did not give you the option of turning that off. So we simply went into super-development mode and added it. 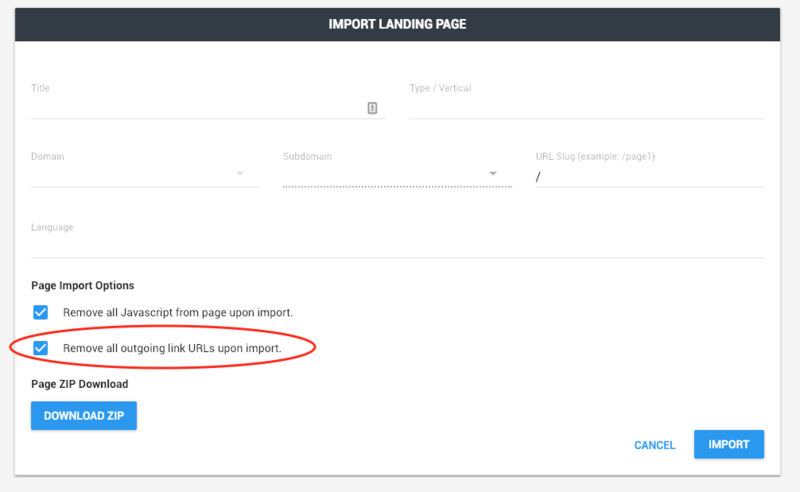 If you are importing your own page, you can keep all your existing tracking codes so it works perfectly. 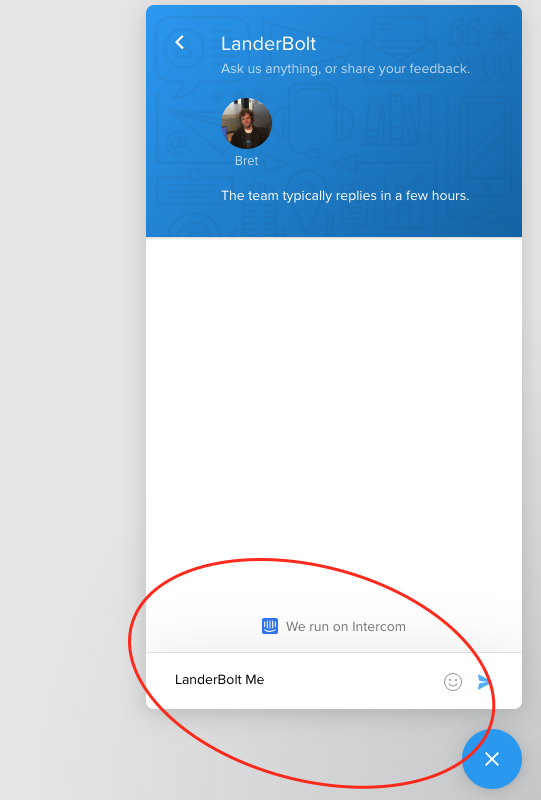 By unchecking the box below, a task that used to take hours is now only one click. 2) Download ZIP File – Everyone has been asking for this. 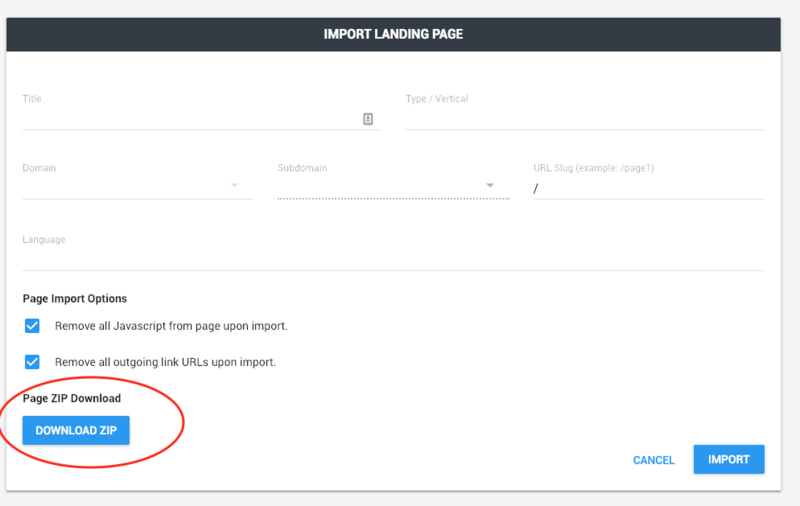 You can download landing pages after they are imported (make sure you have permission to use the page). Our customers have been asking for this for months and now it’s live! Currently you can download unlimited pages, can you see the power in that? 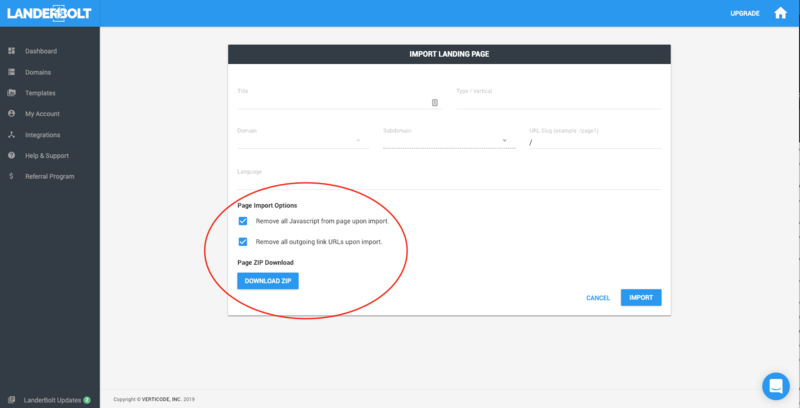 The obvious HUGE value of this is that now you can use LanderBolt to import landing pages, clean them or import them with all the code and then you can download the page for use on your own servers, or keep a collection of pages. If you are code savvy or not, and want to quickly grab a lander this is perfect for you. Right now all 3 of these features are available on every LanderBolt pricing plan. If you join now and not use the free trial, or come back to LanderBolt (we think many former customers will come back now) you will be grandfathered into these new features so when we do reserve these for higher level pricing plans you will always have them. We do not know when we will restrict these features to higher pricing plans. It could be by the end of the month, but we are not sure yet. All of these killer features are “Farm Fresh” only a week old and we need clients who will report any bugs (this should not be an issue).. so in exchange will give you a $300 LanderBolt certificate that you can redeem after your second month of membership. These are non-transferable. Signup here or use the link below and then use the blue button to type “LanderBolt Me” and you’ll be charged for your first month in full. Make sure you use a valid credit or debit card during the signup process. We also have a Paypal option, to use that type “paypal and the plan you want” into the blue button and I’ll send you the link. You will automatically get “grandfather’d in” to these killer new tools plus unlimited ZIP downloads. We will be limiting the number of ZIP downloads per month because our margins are so thin on these so get in now before we we limit how many you can download per month. To summarize, your mind maybe spinning with ideas on how you can now use LanderBolt with the 3 new features, especially unlimited ZIP downloads of imported pages. We love inventing new things based on what you want so please keep the suggestions coming. Copyright 2019 © VertiCode, Inc. All rights reserved.